Slugs, slugs, slugs…. 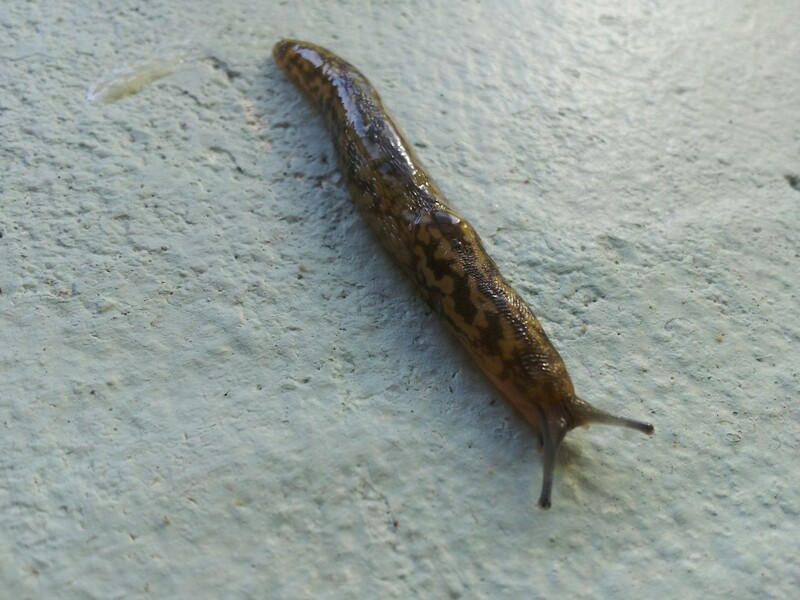 what’s the best solution to ridding our vegetable patches, gardens and borders of these slimy little beings without automatically reaching for the slug pellets? It’s the question I’m asked the most and everyone has their own answer. Before you start obliterating the garden of every last slug in sight however, it’s important to know that not all of them are baddies. Leopard slugs (which we found with a mouth stuffed full of cat food one evening!) also eat dead animals and hunt other slugs. Defra have a page here containing the most common which will help with identification, and I’d recommend you take a peek as slugs can do great work for us in our compost heaps. So now you know your leopards from your common or grey keeled varieties, what can you do to get rid of them? Birds, frogs, toads, Devils coach-horse beetles and hedgehogs all like to snack on slugs. Ducks and some hens (sadly not mine!) enjoy snacking out on them too if you’re lucky enough to have them. 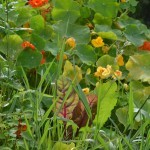 Turning over soil will expose the slugs to birds in dry weather. If you let your poultry roam the garden but are worried about your seedlings and plants, covering the soil with horticultural fleece should be enough of a deterrent to keep them away. Bury shallow plastic containers around your garden (take away containers are the ideal size) and sacrifice a drop of your favourite brew. If you can’t bear to give up your drink, pubs may give you something from the slop bucket if you ask nicely. Be careful not to fully bury the container though – leave a small ‘lip’ above the soil level so that beneficial beetles don’t fall in and drown. Alternatively pour some beer into a spray bottle and spray all the weeds. 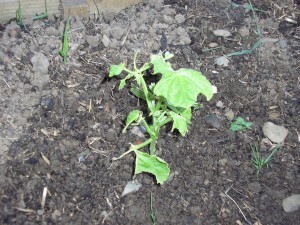 As the slugs like the beer so much the idea here is that they’ll eat the weeds, leaving your veggies alone. You’d have to question whether you want your garden to smell like a brewery though. I’ve tried these and I personally didn’t notice a difference. However, as we have hens and use a lot of eggs I heard a new method recently that I’m going to try. Collect and wash egg shells then heat in the oven to harden them. Put the egg shells in a food processor and blitz until small, then place a protective ring around seedlings. A friend swears by this! You could also use sawdust, sand or seaweed – all of which are might to hinder the slugs movements. Mr G spent ages stripping the copper out of some old electrical wire a few years back, patiently stapled it around the raised beds and placed a slug in pole position to test out the theory that slugs don’t like copper. The slug smooched his way over the wire and straight into the veggie bed. The trick with the copper is to use lots – thick bands can be purchased at garden centres, or even better if your budget will allow, buy copper tools that discard tiny pieces into the soil. If you don’t like to kill creatures of any description you can trap slugs safely. 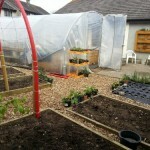 Cover an area with cardboard or black plastic before sowing. 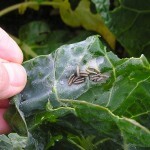 The slugs will all hide under it so that when you expose them a few days later you can pick them off. Slugs also like grapefruit so leave halved and emptied shells lying around (dome side up) with little doorways cut into them. The slugs will head into them, hiding away until you can collect them up and add them to the compost heap. If you prefer to permanently get rid of slugs the quickest way is to put boiling water into an empty milk carton, pick them up and drop them in. 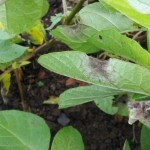 I’ve read that after a few days this foul-smelling solution can be watered onto soil which will detract other slugs from venturing onto it, but have yet to try it. I’ve another friend who simply cuts them in half with scissors – I guess when you’ve seen slugs wipe out your entire seed collection the war is on! ‘Phasmarhabditis hermaphrodite’ also known as NemaSlug are available online that can be watered onto plants. They’re supposed to be very effective but the downside is that they’re quite pricey and will have to be re-applied after six weeks or so. Such as “Growing Success Advanced Slug Killer” or Ferramol Phosphate which is approved for organic farming. 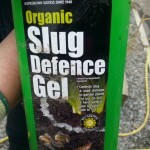 Unlike ‘regular’ slug pellets these will only kill slugs and snails. Regular slug pellets are usually made from poisoned cereals containing Metaldehyde or Methiocarb which (because they are food based) are also attractive to cats, dogs, birds and hedgehogs. Slugs and snails do not like coffee. Sprinkling coffee grounds around plant bases will act as a repellent, as does filling a spray with cold, strong coffee and spraying slugs. This came out tops in a Gardeners World trial a few years ago. They placed a ring of bran around each plant ensuring it didn’t touch the stems. As slugs are almost entirely made up of water, the bran had a desiccating effect which killed them. Salt would have a similar effect but as its toxic to all but a few salt tolerant creatures and plants, and not good for the soil it isn’t recommended. Some plants are known to repel slugs so placing plants such as Astrantia, Lady’s Mantle, Dianthus, Foxglove, Geranium, Peony, Lavender, Phlox, Alyssum and Lobelia, African violet, Strawberry Begonia and Gloxinia may help. It’s unlikely that anybody with a standard vegetable patch/allotment arrangement would go to this trouble but may be worth trying some. I can’t help but think how lovely a lavender hedge around my patch would look and smell though, and attract lots of bees and hoverflies in too. Once they’re a decent size of around 10cm or so in height, transplant them outside. 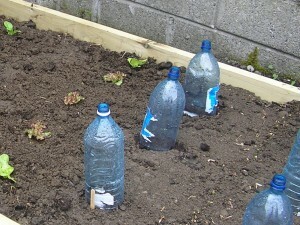 If you’re unable to do this, place a cut-in-half clear drink bottle around seeds/seedlings until they’re bigger and stronger (leave the lid off to allow for ventilation. Slugs prefer dark, damp conditions so if they are a problem in your garden, avoid watering in the evenings. These have been used as a barrier around plants as their sharp edges lacerate the soft-bodied slugs, ultimately leading to dehydration and death. Slugs don’t like the smell so you could try crushing a clove and adding it to the watering can, sprinkling the mixture over areas worse affected. Have you any sure-fire tips for saving your vegetables from slugs? Have any of these worked for you? We have very obliging ducks and hens thank goodness. We also plant a lot of garlic and use the coffee grounds – these methods combined keep us slug free. My Mum borrows my ducks every year once a week for the summer and it helps her keep on top of her shocking slug problem! Okay I am guilty of the chemical route because I am gone all day and never have time to get out into the garden but I will do my best to revert to beer method but slicing with scissors seems appealing too 🙂 Just kidding – they drive me bonkers and destroy all my beautiful lupines. I use the boiling water method Lisa, heading out at dusk with a torch and a bottle & works a treat. Also a good way of unwinding after a day at work weirdly enough. great post – I was really repelled by the first photo but glad I kept reading very informative. I used to put the slugs and snails into my compost bin like a hotel for gastropods is that a good idea or not? Oh, didn’t mean it to have that affect Roisin! Maybe I’ve just gotten used to them. Lots of people do add them to the compost bin – I guess as with anything it depends how many you’re adding. I’ve been known to pick off over 200 slugs from the potato patch in one evening which might be a bit of an overload! Super useful tips!!! So far the good old beertrap only works so well… we have a polytunnel so birds etc are not an option. Might try the eggshell-blend as those copper rims you can buy in selected garden centers do not work either – tomatoplant: goodbye. Thanks Patricia, glad you found the tips helpful 🙂 I used to feel the same about them but have had so many plants nibbled, have no scrupples about heading out at dusk with my torch and plopping them into a carton of boiling water. I found a source of coffee grinds yesterday so am looking forward to giving that method a go too. Garden hygene is important, store old pots and trays etc. away from slug sensitive plants. Pathways between raised beds – I keep minne as clean as possible and occasionally refresh with a mix of ashs and pine needles. I found John Ó Máille’s method rather interesting. He squishes comfrey leaves into balls and places them every few meters. The slugs apparently love it. When they come out to feed, they gather on the comfrey instead of the crops. Pretty neat way of catching them. Will have to put it to the test. (Garrai Glas – episode 6). I wish I’d visited this site first, because I have just spent half the evening wrapping copper wire around my trees and raised flower bed, only to later watch the little bastards crawl right over it. My solution, for this evening at least, was to pick them off and crush them with a pliers. And the ones that weren’t near plants? Oh, they got blowtorched! Muhahahah. I’ve just found this website after searching for slugs eating clothing and material. We’ve been getting slugs inside the house for a little while and no matter what we do we can’t seem to completely get rid of them, just seem to reduce the population (used beer traps, pellets, grapefruit, copper taping, salt and egg shells! ), there is always a new slime trail every morning! The problem now is that I am noticing fabrics inside the house are being chewed and have holes, in particularly fleece type fabrics. Is this still the slugs? I’ve never been aware on slugs eating fabric! We have the same problem with them in the house, they come out at night and I think they came in as a result of all the vegetables we bring in to wash. The best way we’ve found of reducing their population is to come down in the night and switch on the lights then evict them all. That doesn’t sound as bad as you may think… once the lights are out the tend to come out so doesn’t mean getting up in the middle of the night. Could it be moths or mice eating your clothes? Dee I do hope you don’t mind but I’m half thinking of using this post within my notes for next academic year of hort students? Of course I’ll reference you and your blog. If you agree you’ll have saved me a huge amount of work?!? Wow! So glad I found your site! I have been having problems with my grape tomatoes and the only thing I can find is these giant leopard slugs! Eeeew! I was just scooping them up with my fly swatter then flinging them at my neighbors car, but these tips seem good too! Might have to sacrifice the labatts tonight! I am also experiencing these un-wanted pest! The last few years I’ve been finding them in my flower beds. A few weeks ago I was locking up getting ready for bed and noticed one crawling out from under my window trim!! After a few minutes of freaking out and waking my husband to come a remove this slime-ball from the wall I shrugged it off as a fluke. Yesterday as I was watering my flower beds, I noticed one moving up towards my siding as if it had made this trip before! I ran in and got my salt shaker and gave it a salt bath. How do I get rid of these nasty little creatures once and for all? I refuse to share the inside of my home with a huge creepy slime-balls!!!! I don’t think you’ll ever get rid of them once and for all Toni but hopefully some of the tips mentioned will help you tackle the slippery little pests. The coffee grounds have not worked for me. I’m not entirely sure if they worked for me Stephanie but my Hubby has just found a large supply at his workplace so will try them again but in greater quantity. I’ve recently heard that mussel shells are supposed to be excellent – the combination of hard shell and saltiness so am hoping to try those soon too! Great advice in this article – many thanks! Also, I was lucky enough to be given a big bag of pistachios – those salty shells are still keeping the slugs off my favourite plants! Use Helix Tosta or Phasma to increase natural resistance to slugs. I found a very large Limax Maximus near my front steps last summer and I freaked. I’ll never leave my house barefoot in the dark again. Tonight I found three of them near my front porch and I want to burn my house down. I can’t even bring myself to scoop them with a long shovel to place them somewhere far, far away. I swear their large tentacle heads perk up and look at me if I attempt to get close. 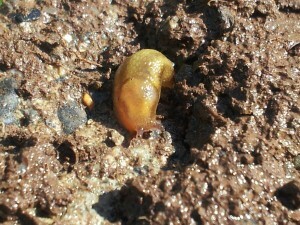 I desperately want to never, ever see one of these massive, disgusting slugs again in my life time. I have an underground well in my front yard and I think they like the dark dampness. Can I sprinkle salt on the ground or is burning down my house the only option? Coffee Grounds work well around your beds but needs to be topped after watering. A solution for this is under bed watering system also the plants love it. Something else to think about is a small electric fence attached to your raised grow beds 2 parallel wires not touching obviously 9 volt battery will work fine. Also not a option for all but vertical farming it won’t stop them all but it makes it a lot more difficult for them to reach your plants. Digging a pond and encouraging frogs into your garden small pond big impact. A friend closeby has a snail farm and that was her suggestion, electric fence! She uses one to keep her snails in. Thanks for your suggestions, ponds are fantastic for biodiversity and pretty to look at too. DON’T CALL A PEST CONTROL CONTRACTOR. SHOW THE SLUG INFESTATION TO AN OPOSSUM INSTEAD: When I bought the house, the outdoor patio was a very nice feature. At some point leopard slugs were introduced with flower pots brought from another location. 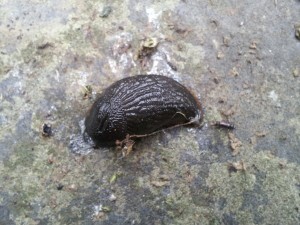 These slugs, up to 5″ long and 1/2″ thick, invaded the tie wall surrounding the patio and the patio became an unpleasant place to be on summer nights. I tried various eradication methods suggested here over the next 8 years with no success. Six years ago, I noticed the first slugs of the season appearing in May. In the morning, I noticed animal poop that looked like digested slugs. This happened by chance with an opossum discovering the slug infestation. (I had been seeing opossums occasionally for years but apparently they had not discovered the slugs prior to this.) All the slugs must have emerged from the wall at some point with the opossum eating every last one of them. 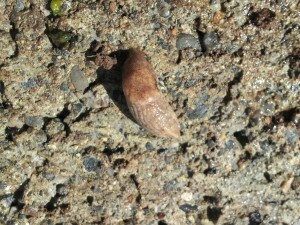 Within 2 weeks the leopard slugs were completely gone and have not returned. Wow, had to look up opossum as we don’t have them in Ireland, lucky you! Hope the slugs stay away.